I’m Not An Expert Artist, Can I Still Do An Art Safari? If I’m not an expert artist, can I still do an Art Safari? Art Safaris are a unique way to experience the African bush and over the last 7 years I have had the pleasure of meeting and teaching guests with a wide range of skills – complete beginners who want to try a different kind of safari; artists who sketch regularly but have never been on safari or sketched animals; a jeweler who wanted to try sketching for a change; those who studied art but haven’t picked up a pencil for years; photographers and non-sketching partners who were intrigued and decided to try sketching for themselves; and occasionally one of our professional safari guides has also been tempted to follow along! Join me at The Bush House, September 15-20, 2018. What makes it easy for anyone to join in and learn is that we are all working at our own pace, with our own choice of materials. There is no competition on an Art Safari, just a friendly, fun, learning environment. You can do this safari with just pencil and paper, so there’s no need to be a painter or watercolorist. I start by showing you how to look at animals and see simple shapes. Yes, even the strangest animals like giraffes or white rhinos can be sketched using simple shapes! Its amazing how quickly you can improve when you spend 4 full days sketching from life. Its the best way to learn and gives you a real sense of accomplishment too. If you’re not already convinced, here are some comments from Art Safari guests. High Praise for Alison Nicholls’ and Africa Geographic’s Art Safari! I guarantee there is something to gain in this experience for everyone. Viewing and sketching the animals live gives you a greater understanding of their movements and their enviroment. For myself the time with you and our Art Safari was the highlight of 2017. My art safari experience with Alison was beyond my wildest dreams. I learned so much about drawing the animals I saw. We went out on two game drives a day and it was such an intimate experience. Alison gave each of us individual attention and tips on our sketches. It was so helpful and encouraging. I cannot describe how wonderful it was to experience really looking at the animal when you are trying to sketch them. We came back to the lodge to do some watercolor and more intimate instruction, as well as watch Alison work on some of her marvelous work she had done in the bush. It was a trip of a lifetime filled with fun, learning and lot’s of laughter. Thank you, Alison for a wonderful experience. If you still have questions, let me know. This entry was posted in African Wildlife, Art Safaris, Blog Posts, Field Sketches, For Artists, Watercolors, Workshops and tagged africa geographic, Alison Nicholls, art holiday in africa, art safari, art vacation, Bush House, sketching safari on January 9, 2018 by Alison. Shimuwini is a lovely Bushveld Camp in Kruger National Park, on the edge of the Letaba River. The view is river, rocks and riverbank for 180 degrees, so every time you look somewhere you see an animal or bird you hadn’t noticed before. Egyptian geese noisily make their own part of the riverbank known to potential rivals; hippos saunter out of the water and graze along the banks; elephants appear from nowhere, dwarfed by the expansive view; waterbuck stand in the shallows; impala delicately pick their way up and down the bank; crocodiles lie quietly on sandy spits of land, jaws agape; saddle-billed storks strut in the rippled water; a brown-hooded kingfisher catches insects in the grass; a hamerkop flies lazily past contrasting with the frenzied hovering of the pied kingfishers. There is too much to watch and too much to sketch. The view as a whole is too big for me to sketch on the size of paper I have available, and I find it nearly impossible to focus on one small area, so choosing a sketch subject is extremely difficult. Even the rocks are interesting – some jagged and dark gray, others smooth and pale. The river itself has several channels – all containing their own daily dramas as every species lives its life. I really do need a week here next time, along with some much larger paper! But, in the time I had – a measly 3 days – I sketched a couple of herds of elephants. Elephants on the Move (below) was sketched late one afternoon as a small herd left the river after drinking, heading uphill into the bush. You can see the soft pastel afternoon colors and how the elephants blend in perfectly with their environment, despite their size. This painting has a calm feeling – all the elephants are moving slowly in the same direction. This contrasts with the 2nd piece – Elephants at Noon (below) where the colors are much harsher. Another small herd had come to drink, but in this painting you can see that I’ve emphasized the jagged rocks, along with the harsher colors. Self-driving and sketching in Kruger is great, especially when you have a husband who likes to do the driving, but when you stay at Shimuwini you don’t even need to go out for drives to see wildlife. If you are thinking of a self-drive visit to Kruger, I’d highly recommend the small Bushveld Camps. As the SanParks (South African National Parks) website says, Bushveld Camps “provide accommodation in smaller, more remote restcamps…do not have shops or restaurants….access is restricted to overnight visitors with reserved accommodation…open verandas often serve as kitchen/dining room.” Some of them have dirt roads that are only accessible to guests at the camp, so you can drive quiet roads and see the bush as it is supposed to be seen – alone! Why not join me on an Art Safari in the Klaserie (a private reserve which is part of the Greater Kruger National Park), then spend some time staying at a Bushveld Camp in Kruger? Is this your kind of safari? Let me know! This entry was posted in African Wildlife, Blog Posts, Elephants, Field Sketches, For Artists, Watercolors and tagged art safari, elephant, Kruger, shimuwini on November 1, 2017 by Alison. So what is an Art Safari anyway? A trip of a lifetime…filled with fun, learning and lots of laughter¹; truly an amazing experience²; one of the best ‘Africa’ experiences I have ever had³. A means of filling your sketchbook with memories of Africa’s iconic wildlife; to really look at an animal and see things that you don’t see from photos⁴, with thorough, humorous, knowledgeable, and patient² instruction from Alison Nicholls. I can’t believe in such a few short days how quickly I improved my sketching⁵. A way to share a unique adventure with fellow enthusiastic artists/travelers⁵, although you don’t have to be an artist to fully enjoy yourself⁷. And…if the 2017 Art Safari was anything to go by…an Art Safari is a way to see honey badgers in camp every night! Circa 2011, from Africa Geographic Travel. Hope you enjoyed my attempt to ‘define’ an Art Safari! Why not join me on an Art Safari in 2018 and see if I got it right? This entry was posted in African Wildlife, Art Safaris, Blog Posts, Field Sketches, For Artists, Watercolors, Workshops and tagged africa geographic, Africa on Foot, Alison Nicholls, art holiday in africa, art safari, art vacation, sketching safari on October 4, 2017 by Alison. 2 New Spaces on 2016 Art Safari! 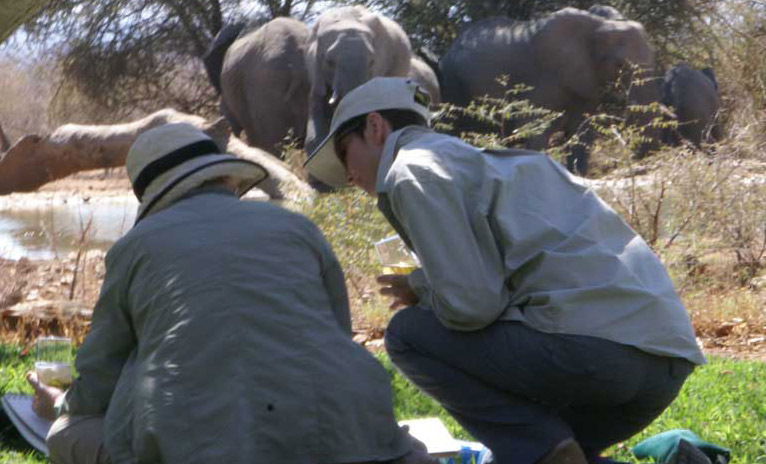 That’s right – we now have 2 spaces available on the 2nd sold out 2016 Art Safari in South Africa. The dates are September 14-18 and the venue is the Klaserie Game Reserve in South Africa on the edge of Kruger National Park. Its prime time for game viewing and a perfect time of year for sketching. If you’re interested in joining me, don’t delay – we don’t expect these spaces to be available for long. Dreaming of an African Art Safari…? Want to discuss art, wildlife and Africa around the campfire…? Check out the Art Safari details and get in touch with me or with Africa Geographic as soon as possible. This entry was posted in African Wildlife, Art Safaris, Big Cats, Blog Posts, Elephants, Field Sketches, For Artists, Watercolors, Workshops and tagged africa geographic, african art vacation, Alison Nicholls, art holiday in africa, art safari, Klaserie art safari on May 20, 2016 by Alison. Normally I sketch in pencil then add watercolor, so I try to make sure I’m happy with my pencil sketches before I start painting. For the 3 small 5×5″ pieces below, I abandoned my pencil completely and went straight in with the watercolor, using a long haired rigger (or liner) brush. The lengthy hairs on this kind of brush mean you don’t have complete control over the paint, so you have to be ready to accept mistakes as part of your work. I’m thinking it will be a great way to sketch when I’m in the bush, so I’ll be teaching this method on the 2015 Africa Geographic Art Safari, along with all my usual techniques. Its amazing what can happen on a sunny day when you are sitting outside mucking around with a new paintbrush! 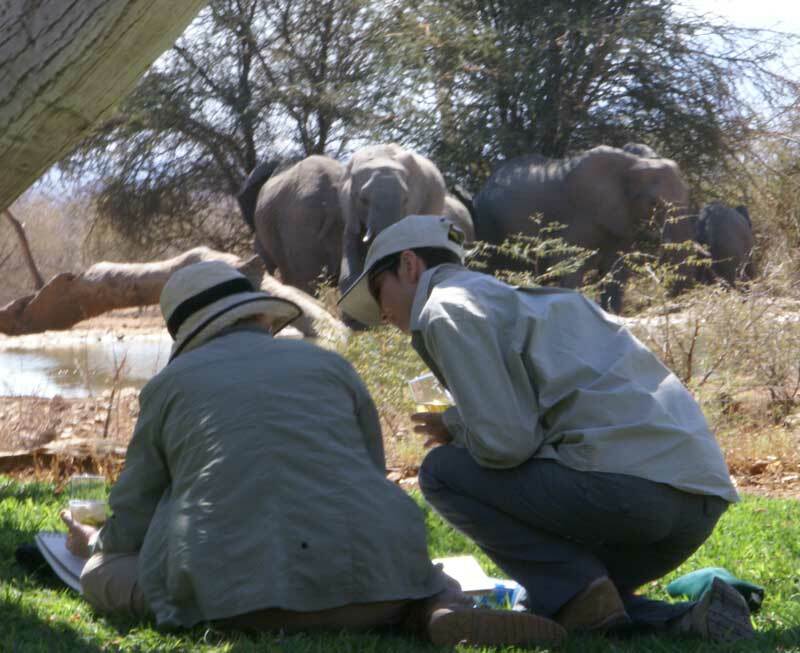 For those artists out there – there is1 place remaining on this year’s Art Safari. Come join me in the South African bush! This entry was posted in African Wildlife, Art Safaris, Blog Posts, For Artists and tagged African wild dog, art safari, painted dog on July 17, 2015 by Alison. Recently Southern African Tourism Update asked me to comment upon Art Safaris in Africa and my views on the advantages of such trips. You can read the article below, but I think the photo above sums it up perfectly. What could be better than coming home with your own completely unique sketchbook from your travels?! Read more about my Africa Geographic Art Safaris.